*This Talk show will be proceeded only in Japanese. Shuhei Endo was born in Shiga in 1960. He received his master's degree at Kyoto City University of Art in1986. He established Shuhei Endo Architect Institute in1988. He has worked as a professor at Salzbulg Summer Academy in 2004, an honorary professor at Northeastern University, and an honorary professor at Tianjin University, and currently he works as a professor at Graduate School of Kobe University. He was awarded Education Minister's Art Encouragement Prize for Freshmen, Japan for "Rooftecture T" in 2003, 9th International Architecture Exhibition Special Award la Biennale di Venezia 2004, Italy for "SpringtectureB" in 2004, ARCASIA Award Gold medal, Sri Lanka for "Rooftecture T" in 2008, and IOC/IAKS Award 2011 and IPC/IAKS Distinction 2011, Germany for "Slowtecture M" in 2011. Ippei Takahashi was born in Tokyo in 1977. He graduated from Tohoku University in 2000, majoring in architecture. He received his master degree in Architecture from Yokohama National University in 2002 and in that year he started to work at Office of Ryue Nishizawa. In 2009, he founded TAKAHASHI IPPEI OFFICE. 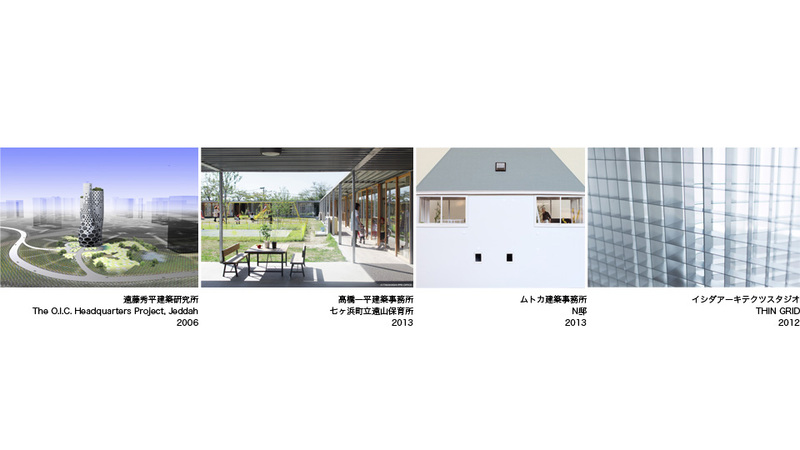 He is also working as a research associate of Yokohama Graduate School of Architecture. His major projects include LRT station and plaza in Okayama, Summer House in Tokyo and Shichigahama Nursery in Miyagi. Toru Murayama was born in Osaka in 1978. He received his master degree at Kobe Design University. He worked at Jun Aoki & Associates from 2004 to 2012 in charge of projects such as "Aomori Museum of Art" in Aomori, "Taro Nasu Osaka" in Osaka and "m" in Tokyo. He cofounded MURAYAMA + KATO ARCHITECTURE / mtka with Ayako Kato in 2010. Their major projects include "N house" in Kanagawa, "tsugiki" in Tokyo in cooperation with the plant shop "Qusamura". Ayako Kato was born in 1977 in Kanagawa. She received her master degree at Osaka City University in 2004. From 2004 to 2008, she was working at Riken Yamamoto & Field Shop and was in charge of projects such as Tianjin Housing Project in Tianjin, China and Dragon Lily's House in Gunma. In 2010, she cofounded MURAYAMA + KATO ARCHITECTURE / mtka with Toru Murayama. In addition to architectural design, she also works as a project researcher at the University of Tokyo and a lecturer at Osaka City University. Kentaro Ishida studied architecture at the Architectural Association School of Architecture in London. He collaborated with Shigeru Ban Architects in Tokyo from 2001-2003 and Swiss architectural firm Herzog & de Meuron from 2004-2012. During his collaboration with HdM he was leading series of international projects as an Associate including Perez Art Museum Miami, Triangle highrise project in Paris and Cultural Complex Luz in Sao Paulo. He established his architectural studio KIAS, Kentaro Ishida Architects Studio in 2012. Alongside his architectural practice he is currently teaching architecture at Tokyo Denki University and Shibaura Institute of Technology in Tokyo.